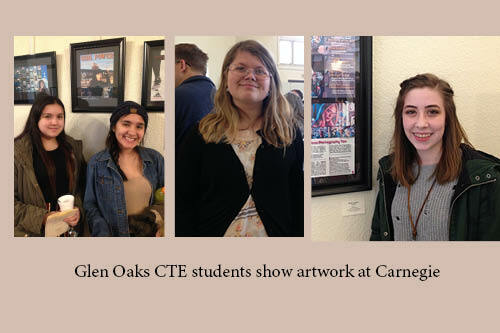 Four Glen Oaks Community College graphic design CTE students are pictured with their works at the opening reception of the St. Joseph County High School Art Students/Glen Oaks Community College CTE Graphic Design show at the Carnegie Center for Arts in Three Rivers, MI earlier this month. Many students teachers and patrons were on hand for the event which closes on March 31. From left are Stephany Bucio Reyes – Sturgis, Mayra Perez Correa – Sturgis; center: Kerrigan Gage – Mendon; and right: Grace Gardner – Constantine.